Are you looking for information about a Holiday Retirement community in Colorado? A number of locations are available to choose from. The Holiday Retirement facilities situated in Colorado are designed with the needs of retirees who want to spend their golden years in this beautiful, scenic state. Holiday Retirement is a large organization that specializes in providing housing for senior citizens. The company operates more than 300 retirement communities throughout the U.S., with several locations in the State of Colorado. If you are looking for a Holiday Retirement community in Colorado, be sure to consider each of the locations before selecting one for your next stay. The company operates a number of retirement properties in and around the Denver and Colorado Springs areas, as well as one location in Grand Junction. Amenities include independent living in apartments (some of which allow pets), all-inclusive meals and social activities, holistic wellness programs, classes and more. Holiday Retirement also has a unique travel program, allowing residents opportunities to spend time at facilities operated by the company located in other parts of the country. Arvada Estates is located in the town of Arvada. This community boasts senior living in warm and friendly apartments near all the regional attractions of Denver. Call 720-457-4723 to find out more. The Courtyard at Lakewood is tucked up in the hills of Lakewood. There are one-bedroom apartments for seniors that include patios, roomy living areas, kitchenettes, and views of the city. Call 720-457-4724 to learn more. Greeley Place is located in the historic community of Greeley. There are roomy apartments for seniors, a full social calendar, and abundant volunteer opportunities to keep seniors engaged. Call 970-673-4388 for more information. Highland Trail is located in Broomfield and has modern apartments near popular destinations like museums and parks. Seniors can explore the great outdoors, participate in enrichment activities, and choose from many living space options. Call 720-457-4725 to learn more. Quincy Place is located in the suburbs of Denver. This large, elegant facility has one-bedroom, two-bedroom and studio apartments for independent living. Call 720-457-4727 to request information. The Longmont Regent property is located north of Denver in the scenic, peaceful community of Longmont. To request information, call 720-204-1746. Sugar Valley Estates is located in the town of Loveland, a northern Denver suburb affectionately known to locals and visitors alike as the sweetheart city. For information, call 970-744-3245. The Parkwood Estates property is situated in Fort Collins on a beautifully-landscaped six-acre stretch of land. Call 970-372-4714 to find out more about this property. The Pueblo Regent community is designed in true southwestern style and is located in the heart of the town of Pueblo. Just outside of Colorado Springs, this property is in close proximity to Pike's Peak and many other regional attractions. Call 719-553-5020 to learn more. The Sunridge property is located in the northern part of Colorado Springs. Residents have a breathtaking view of Pike's Peak and easy access to many other lovely attractions, including Garden of the Gods and Cave of the Winds. For information, call 719-359-4083. The Atrium of Grand Valley is situated in Grand Junction. This elegant facility is close to popular attractions like Grand Mesa National Monument and the Museum of the West. Call 970-812-4522 for further information. Colorado is a popular choice for active retirees. One of the appeals of living in a Colorado town is the beauty of the wide-open landscape and fresh, clean air. Surrounding states like Idaho, Wyoming, and Utah also have a similar appeal, but Colorado tends to have milder weather. 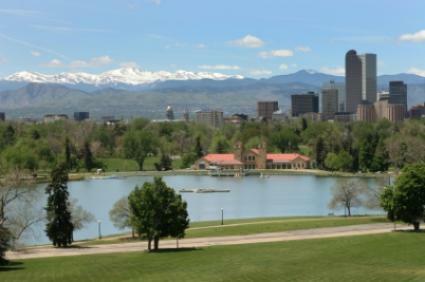 Denver boasts more days of sunlight per year than beach locations like San Diego or Miami. This state is also full of active people and is known as having the lowest obesity rates in the nation, which makes Colorado a prime location for catching some rays and staying healthy. Regardless of which retirement community you end up choosing, Colorado offers an abundance of fun activities and beautiful landscapes to enjoy.